What Does Anxiety Look Like in Children? - Dr, Lynn Miller, Ph.D.
Children Anxiety - What Can Parents Do To Help? - Dr, Lynn Miller, Ph.D. 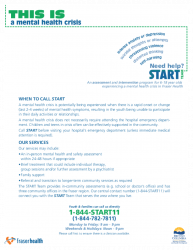 Need help with a child having a mental health crisis? View the PDF Below.